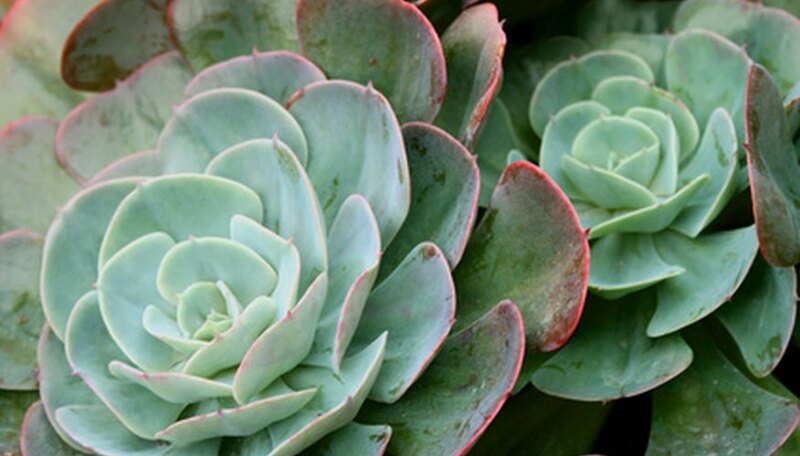 The sempervivum plant, commonly called "hens and chicks," is an attractive, hardy, easy to care for succulent. Although there are over 40 different species of sempervivum plants, all have the characteristics of plump, pointed tip leaves that form rosette-shaped foliage. The plant will flower during the summer months with star -haped flowers in pink or yellow colors. An evergreen perennial, the sempervivum plant is cold-hardy and requires little care. Often found in rock gardens at higher altitudes, the sempervivum plant is also a popular houseplant. Select a location for the sempervivum plant that will receive full sun. The plant will grow best and thrive in full sun, which brings out the subtle colors of red and pink on the edge of the rosette leaves. Use clean contractor's sand or sand for a child's sandbox to mix into your soil where you plan to grow a sempervivum plant, if the soil is not already gritty and well draining. Sempervivums can grow and thrive in almost any well-draining gritty type soil. Water occasionally during the growing period of summer. Allow the soil to dry before sparingly and slowly watering the sempervivums. They need periods of dry soil between watering to thrive and prefer drought-like conditions to grow. Use pruning shears to cut out dead rosettes, top heavy, or wayward growth. Sempervivum plants will spread by sending new rosettes from the mother plant, and can become invasive. Once a rosette blooms, it will die. Use the new "baby" rosettes to fill in where a rosette has died by carefully pruning out the dead, then placing a new rosette you pruned off into the space. If your soil is heavy or clay and you do not add sand to it, your sempervivum plant will likely die from rot. The looser and, actually, poorer your soil is, the better the plants thrive. Too much nutrients in the soil, or over fertilizing, will also be detrimental to a sempervivum and may cause them to rot. It is better to under fertilize, or rarely feed the plants with fertilizer formulated for cacti.